There are two recipes for Monster Cookies in the Amish Cookbook I have. The original version calls for 12 eggs, 3 lbs. peanut butter, 18 cups of oatmeal. Yikes! Thankfully, Mrs. Leroy B. Schwartz didn’t want to be tied to her stove all day, so she cut the recipe down to a more reasonable amount. Cream the butter and sugar together. 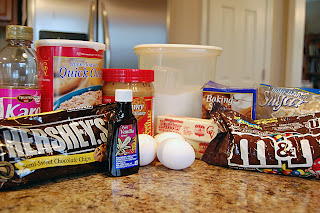 Add the peanut butter and eggs. Mix in the rest of the ingredients. Bake at 350 degrees for 12 minutes. Don’t overbake. This is how many cookies I had left 5 minutes after the first batch came out of the oven. Maybe I should have made the Monster version of this recipe given by Mrs. Jake E. Zook. Actually, I ended up having plenty of cookies for the kids to eat, some to serve to our small group and two gallon-size ziplock bags left over. Not bad for an afternoon in the kitchen. i’ve had these and they are WONDERFUL! 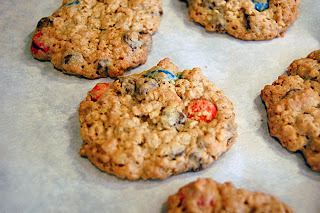 These look great – I love M&Ms in cookies, I like them even better than chocolate chips! 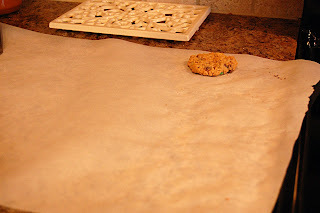 Those look great…my hubby has fond memories of monster cookies made my his grandma. Think I’ll email him this recipe. Maybe he’ll make them for me. Thanks for sharing and I will get to making these tomorrow for my boys!!! Thank you for stopping by on my SITS day last week. I appreciated all the bloggy love! Sorry I’m so long in returning the favor!!! Oh, these look sooooo delish! Thanks for stopping by my SITS featured blog today! I love meeting new bloggers! Yum! Those look fabulous! 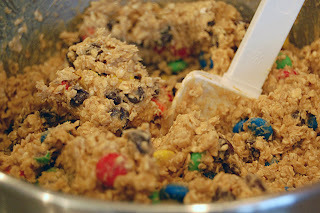 Aiden and I are going to have to give this recipe a try! Made these cookies over the weekend and my family loved them! So simple to throw together! Once again, excellent recipe! Do you, by chance, have the original recipe? No, there’s no flour in them.